It is situated on the south-west side the bay, 4 km from the wharf outside of Ha Long City. The way to Thiên Cung is a perilous one, covered on both sides by thick forest. After entering a narrow gate, the grotto’s 130-meter-long girth opens up. Getting in we are more astonished in front of the very animated and splendid beauty which is made from stalactite. On the east wall of the grotto, there is a grandiose and imposing picture with characters of tales. Going out of the Thiên Cung Grotto, we have a sensation of just watching a unique, meticulous, interesting fine-art museum which is made by nature, get out of the imagine, ability and intellect of man. 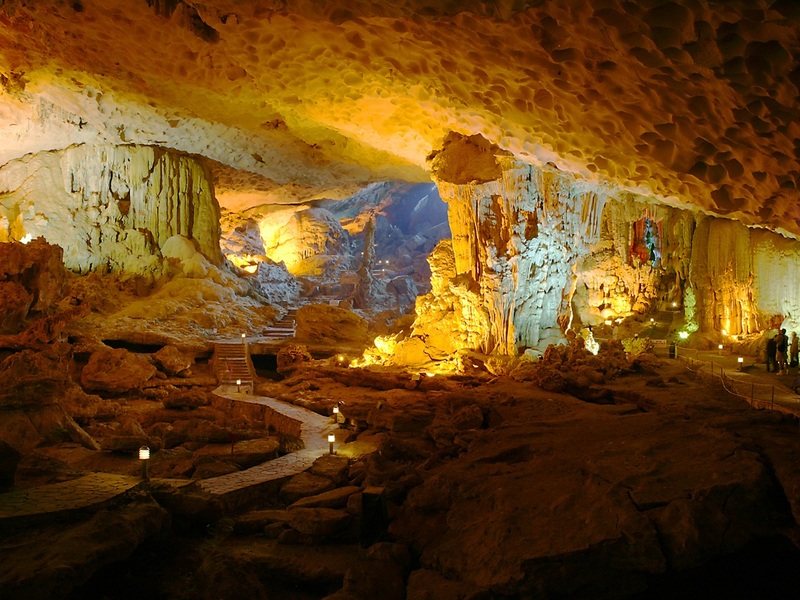 This grotto is recently discovered, one of the most beautiful grottoes in Hạ Long Bay. Legend has it, that beautiful young lady named Mây (cloud), caught the eye of the Dragon Prince and he fell in love with her. They were betrothed, and their wedding lasted seven days and seven nights in the very centre of the grotto. In the centre are four large pillars supporting the “roof of heaven.” From the base to the top, many strange images seem to live in the stone: birds, fish, flowers and even scenes of human life. On the north wall of the grotto a group of fairies seem to dance and sing in honour of the wedding. Under the immeasurably high roof, stalactites make a natural stone curtain. Somewhere there is the sound of a drum beating, but it is actually just the noise made by the wind blowing through stone. Arriving at the last partition of the grotto, a natural gushing stream of water babbles throughout the year. Here are three small ponds of clear water. Legend has it, that this was where Mây bathed her 100 children, bringing them up wisely and happily into adolescence. One path meanders out of the grotto; it was the way Mây, together with 50 of her children, took to harvest new lands. The 50 remaining children, together with their father, were left to build the native land. Left behind by the mother was the natural stream described above. Situated in the centre of the UNESCO-declared World Heritage area, the Sửng Sôt or Surprise Grotto is on BồHòn Island, and is one of the finest and widest grottoes of Hạ Long Bay. Ascending to the grotto, the way is covered by trees and foliage, and consists of great paved stone blocks. Inside, it is partitioned into two chambers; the first one being similar to a wide theatre hall. Many stalactites hang from the high ceiling, with numerous possible forms and shapes. A narrow passage leads to the second rooms, where a flow of light meets visitors. The chamber is so immense it could contain thousands of people at one time. At the deepest point of the grotto, a “royal garden” appears with a clear pond and a seemingly fascinating landscape of mountains. Many birds and plants (benjamin figs, cycads and centenary banyan trees) live here. On nice days groups of monkeys might arrive in search of fruit. It is situated in the central tourism centre of the bay, as well as Ti Tốp Beach, Bô Nâu Grotto, Mê Cung Grotto and Luồn Grotto. French named it “grotte des surprises” (grotto of surprise) From the wharf, you climb 50 steep stone stairs to the mouth of the grotto, which lies 25 m above the sea level. Going down some 10 stone stairs, you reach the mouth of a grotto. The grotto covers some 10,000 m2. Inside the grotto there have thousands of stalactites and stalagmites along the 500-meter paved passage. Light posts line the passage and serve as signposts and ornaments. The lighting system with elegant styles adds more charm to the beauty of the grotto. In the first chamber, in the very middle of the grotto, is a colossal pillar supporting the large vault. On the top of the pillar, there appears to be a monk draped in a long, dark cloak, with his right hand clasping a cane. The second chamber is narrow. Here, the stalactites look smaller but more graceful. One feels like going to a pagoda with a monk in meditation so that one steps more gently. The third chamber features high stone columns out of which nature has carved images of a large kingdom, of heroes and soldiers holding swords and spears rushing up, of war elephants and horses or lions, etc. All of them suddenly was petrified and remained there for good. Up in the 30-meter roof of the grotto, one can figure out small, soft and even concave spots, which look like patterns in the ceiling of a theater. A huge piece of stone stands up to the ceiling by the grotto’s mouth. This evidences one of the typical karst-style grottoes with high scientific values. At the side of the entrance, the rock seems to form the shape of a horse with a long sword. Legend has it, that after having defeated the Ân aggressors, Thánh Gióng (the Saint Gióng) helped the population to chase away evil spirits and demons. After this feat, Saint Gióng flew to heaven, leaving a stone horse and sword to continue to keep the demons away. Situated on Bồ Hòn Island, 14 km south of Bãi Cháy Beach is the Luồn Grotto. In front of the grotto is Con Rùa Islet, and the Sky Gate is on the right. Here the cliffs stretch vertically out of the pure blue and smooth water. At the water-level, an arched entrance leads to the grotto, just at the base of the island. Passing through the pretty entrance, you come across a tranquil round lake, surrounded by luxuriant trees and high dangerous stone walls. Monkeys run to and fro in groups, benjamin fig trees shade the landscape and many orchids hang their sweet-scented flowers. In the lake, many species abound: shrimp, fish, crab and cuttle-fish. This is an enclosed group of islands. It connects with the sea via a 4-meter-wide, 100-meter-long, and 3-meter-high mouth. Inside the grotto, the 1-km2 brackish lake is surrounded by mountains. On the cliff one still find traces of fossils of fresh-water snails, which prove that men used to live there and this must have been a deep valley then. The beauty of the site, is the mingling of a number of factors: the mountain’s size and form, the colour of the water and the clouds. Two kilometers south-west of Ti Tốp Beach is the Mê Cung Grotto or Bewitching Grotto. It formed on Lom Bò Island, and seen from afar, the entrance is like the roof of a house denting the island’s side. After a narrow crack only allowing one person through at a time, many partitions appear. These chambers are somewhat small and narrow, but very refined, and with many stalagmites and stalactites bearing beautiful forms. It is dry and well-ventilated, and features a thick layer of shells forming the foundation of the entrance. Formerly, this layer was 1.2-meter-thick and semi-fossilized. In the course of research, there was also a fossilized animal’s skeleton discovered in the interior. The Mê Cung Grotto has been recognized by archaeologists as one of the vestiges of the pre-Ha Long new Stone Age culture, that existed between 7,000 and 10,000 years ago. Pushing into the grotto, tourists feel like walking in a palace of a Persian king. Hearing the murmur from out of nowhere, you think that Scheherazade is telling the stories of the Thousand and One Nights for her king. On the island, there are many ancient trees casting long reflections on the water of the bay. They are home to many species of birds and animals (monkeys, chamois and varans).